A while ago I took a quick hop up across the border to Vancouver. It was a surprisingly short and cheap trip. A great way to get out of town for the weekend. After talking to a few locals it became pretty evident I had to stop by a hamburger joint called Moderne Burger. I wasn’t quite sure what to expect because this is after all a hamburger we are talking about. Coming from the USA, I thought to myself, “what could this guy possibly do to a hamburger that I haven’t already seen done and tasted of not tried myself?”. I was blown away! Unlike every other gourmet, fancy restaurant chef’s interpretation, which often takes the hamburger to all manner of places one should not, Moderne Burger takes the hamburger back, way back to it’s humble beginnings, in a very unique way I have not seen before. Upon arriving I met the owner Pete and introduced myself. Fortunately I arrived early in the day – as suggested by many – because this modest joint does get unbelievably busy. Pete got right to it. He recommended the Classic Burger with a BBQ onion sauce. Condiments are kept to a minimum. They detract from the subtle flavors in a good hamburger and pickles numb the palate. They are often used by many to mask the lower quality meats and non-fresh ingredients used by most in hamburgers as well as the copious amounts of seasoning to give some semblance or flavor to an otherwise bland hamburger patty. I couldn’t agree more! This has been my never ending frustration with almost every hamburger I’ve tried to stomach here in the states. After many years of being on the road for work, Pete decided to address the lack of a true and honest to goodness hamburger. 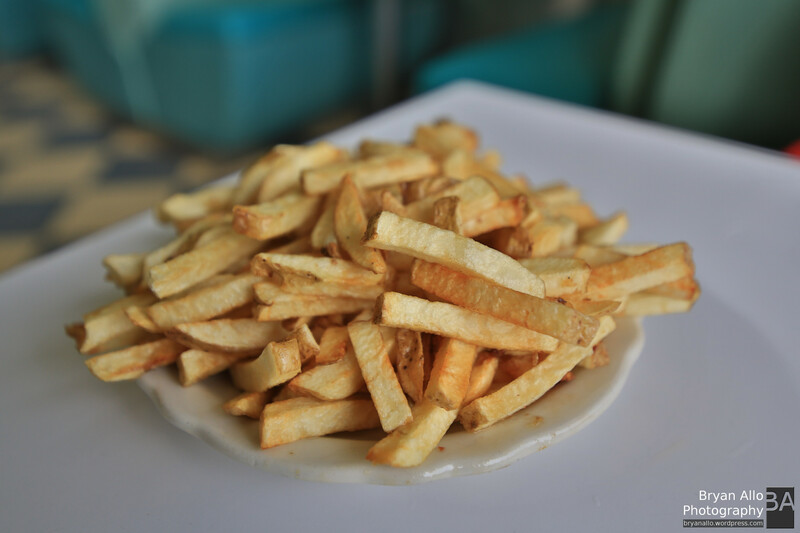 Moderne Burger has been serving it’s only menu item for over 14 years now. Every serious foodie in Vancouver has no doubt indulged. This is a definitive reference burger joint. Fries are cut fresh to order and come in a side serving big enough for two or three, but honestly they were so good, I could eat the whole plate myself. They are not drenched in salt (like everywhere else) and come with a small side of creamy house dip. The taste pairing was spot on. The buns were baked in-house that day and caramelized to lock-in the moisture, as opposed to toasted which dries out the bread and renders it dry and brittle. Pete walked me through his signature hamburger eating technique which did in fact turn out to be very effective and efficient. Next he recommended one of the house special milk shakes. The creative options were staggering. We settled on a coffee and malt milk shake. He also went over the best technique to drink a milk shake so it does not melt. The milk shakes also came with a small glass of Coca Cola as a chaser and palate cleanser. I looked at Pete as though he was off his rocker, then I tried the chaser and the pairing was something out of this world I had never experienced before. 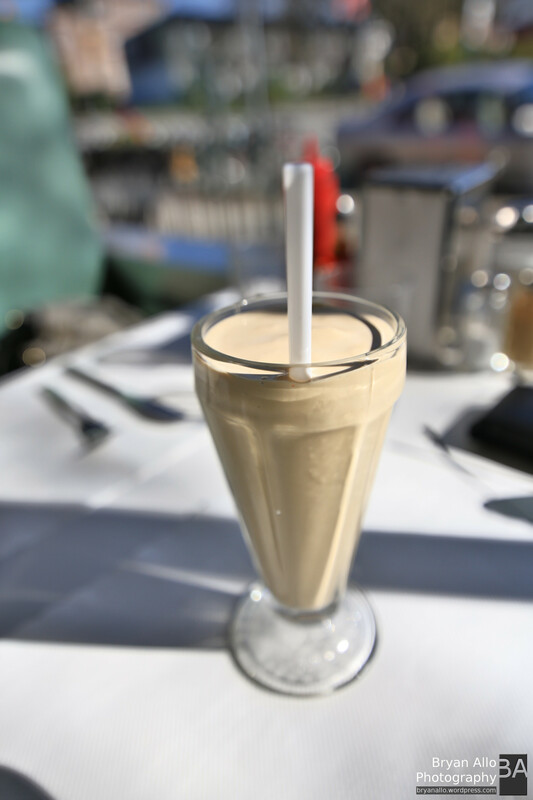 It made every sip of the milk shake taste like the first sip… magical, sublime. If there ever was a Foodgasm, this must be what it feels like…LOL. 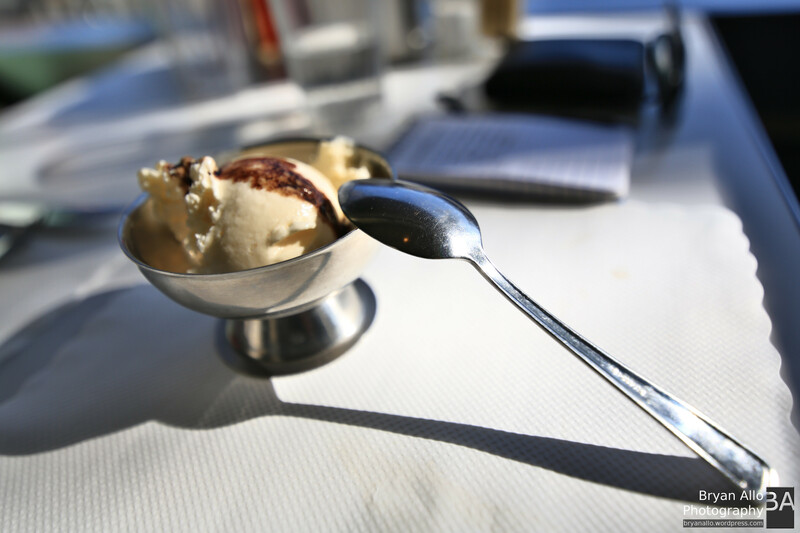 Just when I thought the gastronomical roller coaster ride was over, Pete suggested desert – a scoop of vanilla ice cream topped with a tangerine balsamic vinaigrette reduction. “What! ?” I exclaimed. At this point I had resigned all my faculties and submitted my stomach to whatever he recommended. Desert was out of this world. It is not often that I go to eat somewhere and every item served hits a home run; that I sit back and smile in disbelief every time I think about my experience. My cheeks are aching from smiling the entire 30minutes I’ve been writing this post. I had to take a break after sorting through the photos last night. Thank you Pete and Moderne Burger. I will fly out to Vancouver just to have another Moderne Burger.